Hilton Honors is currently offering a 50% discount when you buy 5,000+ points – see this page and click through. A 50% discount is equivalent to getting a 100% bonus. This offer does not seem to be targeted but I can’t be certain. If you don’t see it when you click through, it is targeted! This may or may not be a bargain as it depends how you redeem them. At the top end, you can buy 80,000 Hilton points for $400 (£303). That is 0.5 cents each. Regular readers of Head for Points will know that I tend to value Hilton points at 0.33p each, which is a little less than you are paying here. Five star Hilton, Conrad and Waldorf-Astoria hotels typically run to 80,000 points per night. The Conrad New York, which I reviewed here, has a cap of 80,000 points per night. In this sale, if you got the full 50% discount, you would be paying $400 for 80,000 points. Given that the Conrad New York sells for over $600 on many dates, it can represent a saving. Similarly, buying points would often be a good deal at Conrad Tokyo which I reviewed here. Hilton Honors is also a decent deal at cheaper point levels. The Hampton by Hilton in Sheffield, for example is capped at 10,000 points per night. At 0.5c per point you would be paying roughly £38 per night if you bought the points. That is a 60% discount on the typical nightly rate of £100. Hampton properties include free breakfast as well. On the other hand, the Hilton Sheffield costs up to 30,000 points per night. Even with 50% off your points, you would be paying around £114. Whilst a bit less than the typical £125 cash cost, it is not a great deal – especially as you would earn points and miles back on the cash rate. One upside of a reward night, of course, is that it is cancellable without penalty. At the most extreme, you could buy the Hilton Salalah resort in Oman, reviewed here, for £19 a night assuming a 50% discount. That would be the rough cost of buying 5,000 points in this promotion. What I can say is that, at a 50% discount, you shouldn’t lose money buying Hilton Honors points at 0.5 cents. If you just buying a handful of points to top off your account, the price per point doesn’t matter anyway. If you a few thousand short of a redemption then this is a decent opportunity to top them up. The link to buy is here. The offer closes on 5th October. American Express has launched a new wave of travel-related cashback deals. Some, all or none of the offers below will be found on the ‘Offers’ section of your online statement page, or in the Amex app. You need to ‘save’ the offer before it is activated. Valid to 31st October. UK locations only and you must book via a special Amex / Avios website. Valid to 31st October. You do not need to be staying at the hotel to qualify (and if you were, I think you might need to pay the bar or restaurant bill direct rather than charging to your room). Valid until 29th September. Includes The Tower and The Cumberland in London. Valid until 29th September. Remember that the Thistle at Heathrow allows you (for a £5 fee) to take the driverless pods from the car park behind the hotel directly to Terminal 5 – more here. This is a more upmarket airbnb! Ends 30th September. Valid to 26th January, pay at hotel check-out only. SLH is also an Avios partner – see here. Valid to 26th October. Selected hotels only. Valid on pre-paid or pay at hotel stays. There is also a decent Laithwaites wine deal available until 30th November – £50 off a mixed case of merlot. Click here for details. You do not need to save this offer to your card as the discount is applied automatically. The offer is open to anyone with an Amex card. 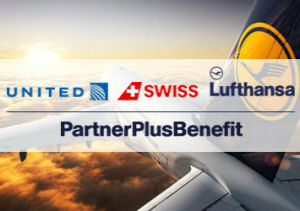 PartnerPlusBenefit is the small business scheme for the UK and Ireland run by 11 of the Star Alliance airlines. This includes Lufthansa and Swiss. I wrote about PPB in detail in this article. It is a LOT more flexible than the British Airways On Business scheme which I reviewed here – although you’d be daft not to join On Business too if you have a VAT registered UK business. Click here to sign up – you’ll receive 1,500 BenefitPoints just for joining. Until 6th October, you will receive triple BenefitPoints when you fly from the UK or Ireland to Frankfurt (212 flights per week!) or Munich (131 flights per week) on Lufthansa. I’m not sure if this includes the Lufthansa codeshare on the bmi Regional services from Bristol. You need to register for this offer in your PPB account online on the ‘Special Promotions’ page. What are the best hotel promos at present? Okay, I used the 50% off Hilton Honors points link to buy 5000 points, which will get me over what I need for a particular redemption. I instantly received an e-mail saying “Your Hilton Honors account and Points balance have been updated to reflect your Points purchase”, but its now about 7 hours later and the points have not come through. Is this normal? How long should it take? Conrad Maldives might be good value? At £350 or so for a reward night this may be a bargain? Yes if there are standard room awards, but if all you’re looking for is to maximise your return then you will get an even better bargain at Samui. If you otherwise need or want to keep costs down then that’s easy in Thailand but not in the Maldives. Decent value for Maldives if your Gold/Diamond, with the complimentary sandwiches on offer at 4-5pm and then free happy hour meant if we dined out later we’d just have a main course or even just a starter.